Here’s a great snack or appetizer to share with friends and family. The nitrate-free bacon and scallops contain healthy protein that will provide usable nutrients for your day. To keep on track with your diet, stay away from appetizers that are fried or filled with carbohydrates. 1. Preheat oven to 375 degrees F. Grease a baking sheet with coconut oil, set aside. 2. Over very low heat, in a small saucepan, melt the coconut oil. Remove from heat and pour into a small bowl. Add the garlic, paprika, salt and pepper. 3. 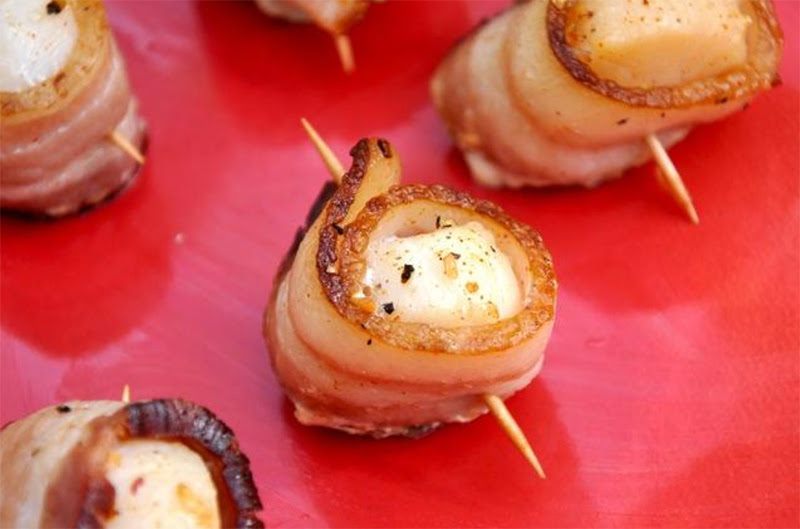 Dip each scallop in the seasoned coconut oil, the wrap with bacon and secure with a toothpick. Place on prepared baking sheet. 4. Bake for 15 minutes or until the scallops are cooked through and the bacon is crisp. One serving equals 92 calories, 7g fat, 133mg sodium, 1g carbohydrate, 0g fiber, and 7g protein. Copyright © 2019 Miracles Fitness, all rights reserved.